According to Statistics Finland, 78% learners enrolling in further VET had acquired another qualification: initial vocational (39%), bachelor (11%) or general upper secondary (9%). 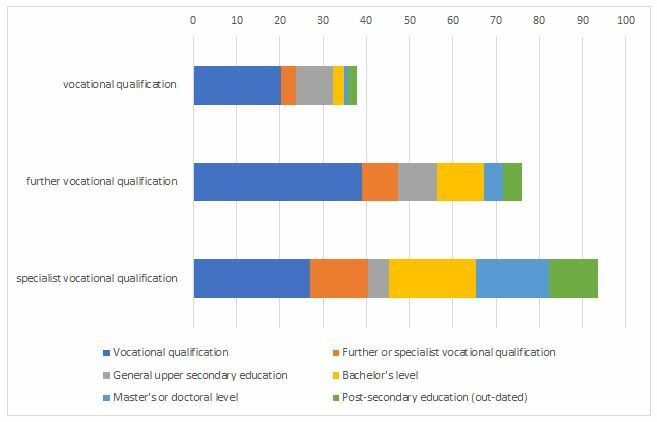 In specialist VET, only 6% of learners have no previously acquired qualification but 37% have a tertiary diploma. Initial vocational qualifications are usually acquired by young people after completing compulsory education. But they are also attractive for other groups: with initial vocational qualification (20%) or with general upper secondary certificate / after passing the matriculation examination (8%). NB: Most recent data, 2016. The share also varies by study field. In vehicle technology and ICT vocational qualifications approximately 85% of learners have no previous education experience except for compulsory studies. In programmes leading to specialist qualifications in court interpreting, rural development and management, 36% of learners have at least a master’s degree.